It Is a Fabulous Gift! When I was little I remember eating Macaroni and Cheese and grilled cheddar sandwiches. Not too much variety! I also remember going to the grocery store with my mother and watching the grocer (or cheese monger) cut off a piece from what seemed to me at the time, a huge wheel or brick or log. Then, for a short period of time as a youngster, I would only eat Velveeta! Not good! Trying new types can really be fun ...really! You can try the products the way I like to. Find a gourmet shop and ask to sample some. It really is that easy! Like wines and other foods, the best way to decide on your favorites is to taste them, and any good wine-seller or cheese monger will be happy to provide a sample before you buy. You can join a monthly club. Try it. You'll love it. Or sign up with a restaurant for a tasting! Another way to try different types (Plan "D") is to invite a few friends over and ask each one to bring one they want to try and share. Make up a tray or "tasting table" and have several wines or beers available to try with the product. You might want to set a theme for each time you do this. Have some fun! Is there a Farmer's Market nearby? 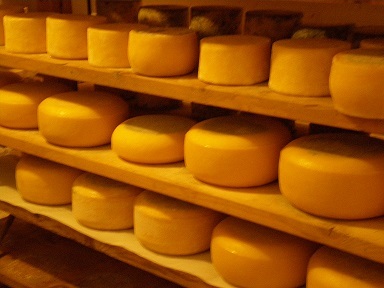 You will often find local cheese makers there. This is really a fabulous way to learn. 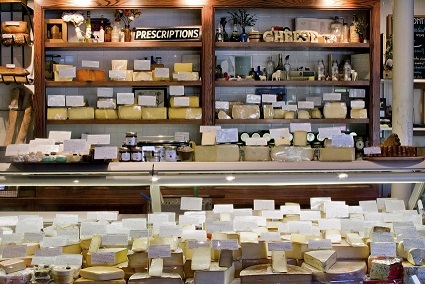 Most small cheese makers sell organic products. I am a believer in buying such product whenever I can find it. I am also fortunate in having several organic cheese makers near my home. There are hundreds of types produced all over the world. But until recently it seems most Americans settled into buying the same four or five every time they went to the store. I believe this is just a habit developed as a result of not knowing what else to try. 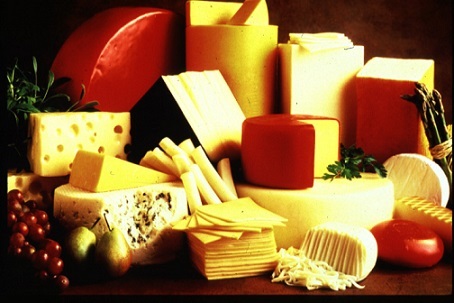 Cheddar, Mozzarella, Swiss, Parmesan and some Blues (bleus) are "known" and "safe." Some time ago, even before I started the restaurant, I began trying different selections and found a number I really liked. I also discovered some that I really did not care for. Often the ones I personally didn't like were pungent or very strong-flavored. But then I learned something else. Some of these need to be eaten with certain other kinds of food or with certain kinds of beverages to be enjoyed. This discovery led me to try more, pairing them often with different beer and wine. Today many people are beginning to understand the huge variety available from all over the world and they are more interested in trying them. I see this interest from my restaurant guests. When I introduce a "new" one in a recipe, or on an appetizer plate, they are more and more open to trying it. And they even seem surprised they like it. I have read a great deal about how different types are made. 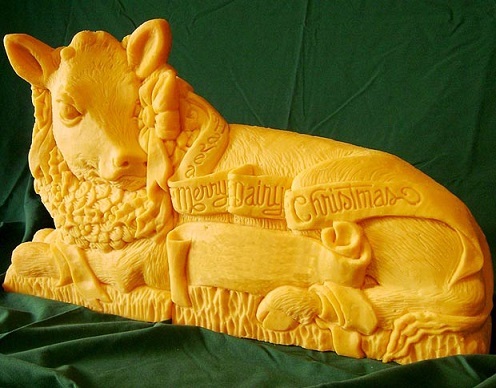 Cheese is made from the curdled milk of certain mammals, primarily cows, goats, and sheep. The milk is curdled using some combination of rennet (an enzyme) or more and more often, rennet substitutes, and acidification. Bacteria acidify the milk and play a role in determining texture and flavor. Different styles and flavors are the result of using different species of bacteria and molds, different levels of milk fat, differences in length of aging, different processing treatments and different breeds of cows, goats or sheep (even buffalo). Other factors include the animals' diet and the addition of flavoring agents such as herbs, spices, or wood smoke. Whether or not the milk is pasteurized may also affect the flavor. No one system of categorizing satisfactorily works to address all the diversity available. Categorizing by firmness and texture is common but not exact. The lines between "soft", "semi-soft", "semi-hard", and "hard" are often blurred, and many types are made in softer or firmer variations. Harder ones have lower moisture content than softer ones. They are generally aged for a longer time. The term “fresh” is used to describe selections that have not been aged, or are very slightly cured. These have high moisture content and are usually mild and have a very creamy taste and soft texture. 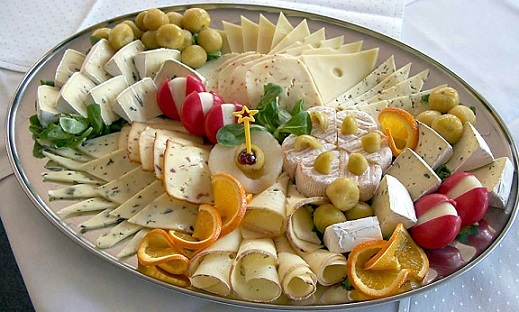 This category includes Italian Style Mascarpone, Ricotta, Chevre, Feta, Cottage and Cream Cheese. The term “soft-ripened” describes those that are ripened from the outside in, very soft and even runny at room temperature. The most common soft-ripened ones have a white, bloomy rind that is sometimes flecked with red or brown. The rind is edible and is produced by spraying the surface with a special mold, called penicillium candidum, before the brief aging period. Examples include brie and camembert styles and triple crèmes. “Semi-soft” describes selections that have a smooth, generally, creamy interior with little or no rind. These are generally high in moisture content and range from very mild in flavor to very pungent. Examples include blue, colby, fontina styles, havarti and Monterey Jack. Also, a lot of washed rinds fall into this category but are described separately below. This is a very broad category. Their taste profiles range from very mild to sharp and pungent. They generally have a texture profile that ranges from elastic, at room temperature, to the hard ones that can be grated. This category includes gouda styles, most cheddars, dry jack, Swiss (Emmenthaler) styles, Gruyere styles, many “tomme” styles and Parmesan styles. These have a distinctive blue/green veining, created when the Penicillium Roqueforti mold, added during the cheese-making process, is exposed to air. This mold provides a distinct flavor, ranging from fairly mild to strong and pungent. Blues are found in all of the categories above, except for Fresh. 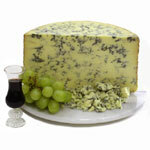 Common examples are the French (Roquefort), the Italian (Gorgonzola) and the Danish blues. This is a whole family of styles, mostly of Italian origin. These are cooked and kneaded. This family of styles can range from very fresh to hard grating. The pasta filata family includes Italian style Mozzarella, Provolone, and Scamorza. “Natural rinds” have rinds that are self-formed during the aging process. Generally, no molds or microflora are added, nor is washing used to create the exterior rinds, and those that do exhibit molds and microflora in their rinds get them naturally from the environment. Because most natural rinds are aged for many weeks to develop their flavor as well as the rinds, many natural rinds are made from raw milk. The French Tomme de Savoie and Mimolette style, the English Stilton (also a blue) and Lancashire style are examples. These are surface-ripened by washing the product throughout the ripening/aging process with brine, beer, wine, brandy, or a mixture of ingredients, which encourages the growth of bacteria. The exterior rind of washed rind cheeses may vary from bright orange to brown, with flavors and aromas that are quite pungent, but the interior is most often semi-soft and, sometimes, very creamy. This category includes some tomme-styles, triple-crème and semi-soft styles similar to Epoisses, Livarot and Taleggio. WOW! This is a lot of information. Click on “Article Number Two” for more information if you wish.